Our pal Isabel went for a holiday in Montreal last week and very kindly brought us back some pretty special bagels. Anyone who has ever had a Montreal-Style bagel will know why these are considered to be a treat, worthy of the luggage-space required to bring some home to friends. As described on wiki here, they are 'a distinctive variety of handmade and wood-fired baked bagel. In contrast to the New York-style bagel, the Montreal bagel is smaller, sweeter and denser, with a larger hole, and is always baked in a wood-fired oven. It contains malt, egg, and no salt and is boiled in honey-sweetened water before being baked in a wood-fired oven, where the irregular flames give it a dappled light-and-dark surface colour. These bagels specifically remind me of Valentine's Day actually, so the timing was right. It's been six years now since this happened, but Nick and I went on a romantic trip to Montreal over Valentine's once. That was the only time we've ever traveled for Valentine's Day, and the perfect memories of our visit to this beautiful city are etched in my head. We took the train to and from, spoke French, drank champagne in a ritzy restaurant, bundled up well and took walks in the perfect winter-wonderland weather. Oh, and of course, we ate Montreal bagels for every breakfast, in an authentically old fashioned delicatessen, down the street from our hotel. 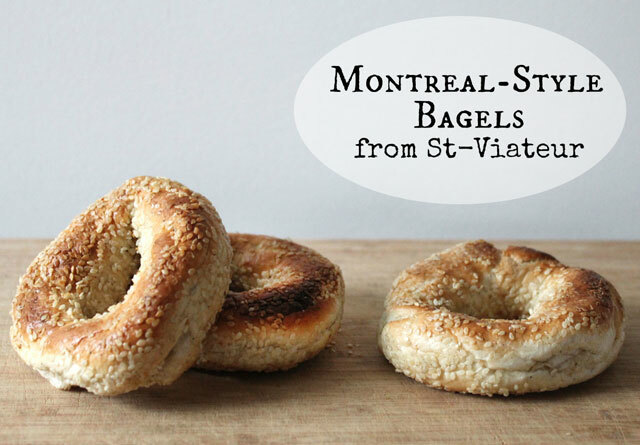 One afternoon we happened upon the epicentre of bagel making in Montreal, St. Viateur, where they've been making them for 62 years, and are probably the reason why Montreal-Style bagels are a distinct 'thing'. They make them in-house, right before your eyes. It's really neat to see. So when Issy emailed to say she had half a dozen fresh St. Viateur bagels for us, and would be dropping them off after work, we were pretty happy. 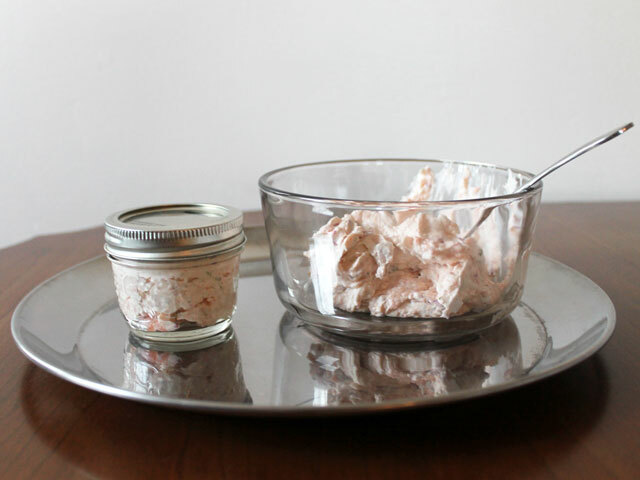 I went right out and bought the makings of the perfect topping for them -- a Smoked Salmon and Cream Cheese Spread. 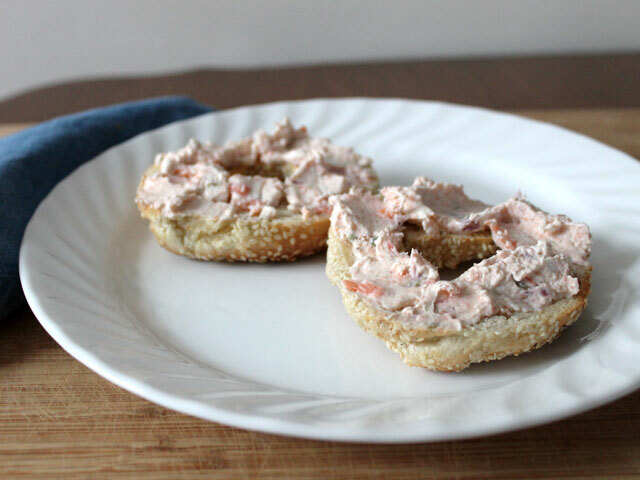 I usually make this for parties, where it's always a very popular choice on the food table, but this time I decided that having the bagels was party enough to warrant making some. Plus, I wanted to repay one good turn with another, and give some to Issy to take home to have with her bagels. 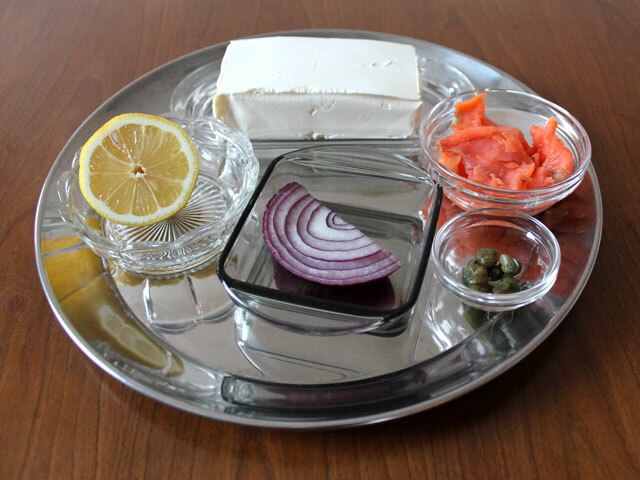 This spread includes all that usually comes with a classic bagel order : Smoked Salmon, Cream Cheese, Capers, Onion and Fresh Lemon juice. Smoked salmon is quite pricey here when you buy it in nice uniform slices, but something you might not know is that shops often sell the exact same salmon, but much less expensively, in 'tidbit' form. 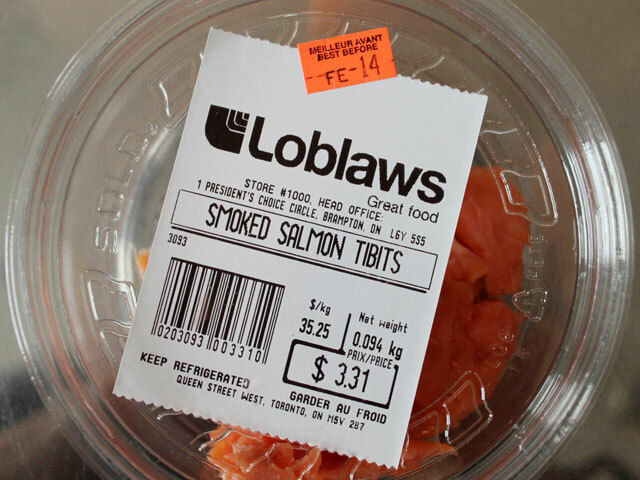 My guess is that these are the pieces of the salmon that are left, after the tidy slices are removed, but as far as your taste-buds go, it's the same thing, only in a less attractive format. But who cares how it looks when you buy it, when you're going to incorporate it into a spread! 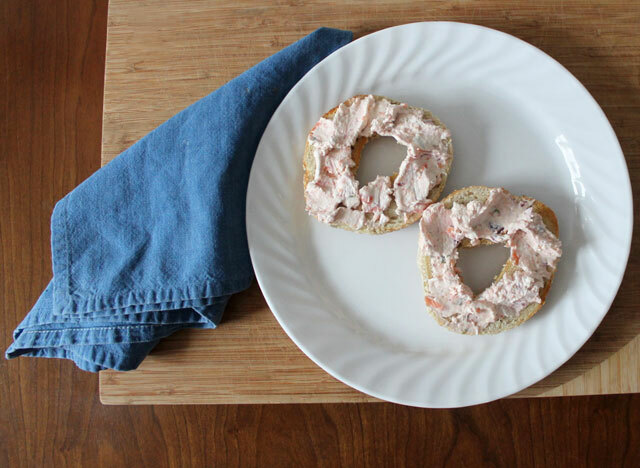 You don't need special bagels to enjoy this spread though. It is also good on crackers or slices of baguette, or on regular bagels too. 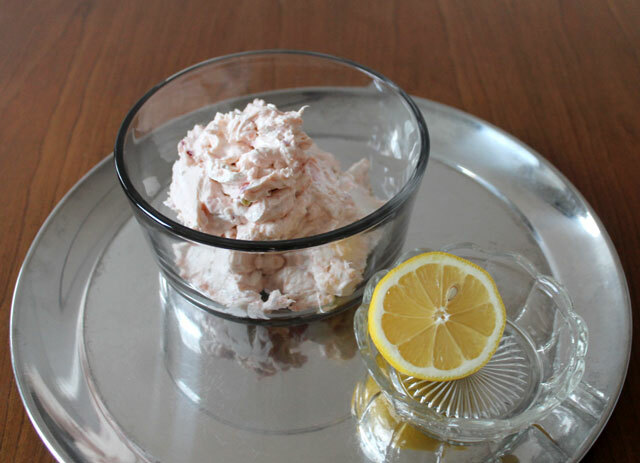 You might consider surprising your Valentine with a tasty appetizer or breakfast including it, this weekend. Put onion, capers and lemon juice into the bowl of a food processor. Whirl it until it's finely chopped. 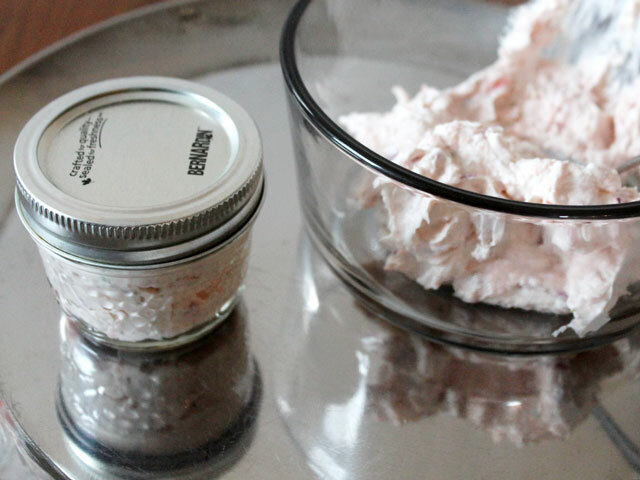 Cut your cream cheese into rough cubes and add. Whirl it all together well. Add the Smoked Salmon pieces and whirl until just blended. Remove from food processor and taste it to make sure the capers and salmon have added enough saltiness for your liking. If not, finely chop a few more capers and mix them in with a spoon, so as not to pulverize the salmon in the food processor, as it's nicer when there are a few chunks of it visible in the spread. Also add more lemon juice if desired. 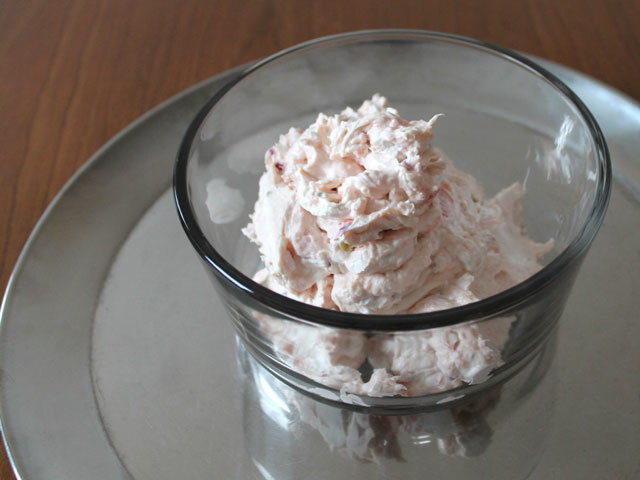 This spread keeps well in the 'fridge and can be made in advance. Thank you very much for checking out my post. Hope you're having a fine Wednesday. a yummy post ! !, and as always love your photographs !! I’ve only had mass produced bagels from the grocery store. There’s no such thing as fresh bagels here. Sad face!! a beautiful topping for some very special bagels!! what a fantastic treat.